I wanted to pop in quickly to re-post the announcement that was posted in our News Feed over on the store website. 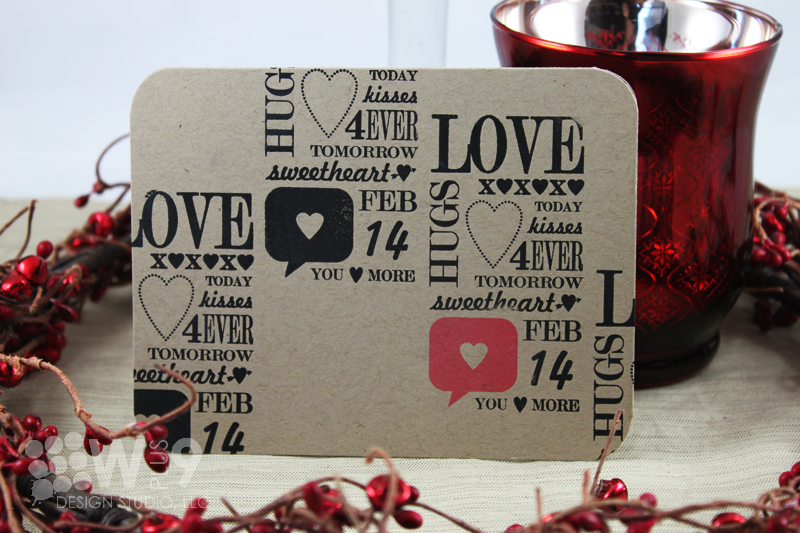 We have had an influx of orders this month due to an increase in both direct orders and our wholesale program. Thank you all so much. Your support is truly appreciated! As a result, our already modest inventory is much lower than normal. Please be assured that I am monitoring our ordering trends closely and will be adjusting our starting inventories accordingly to keep up with demand. Our restocking guidelines will also be adjusted accordingly to ensure that the wait times you endure for a sold out item to be restocked is minimal. We will post another announcement as soon as they arrive. Be sure to subscribe to the News Feed if you have not already to be notified as soon as possible. 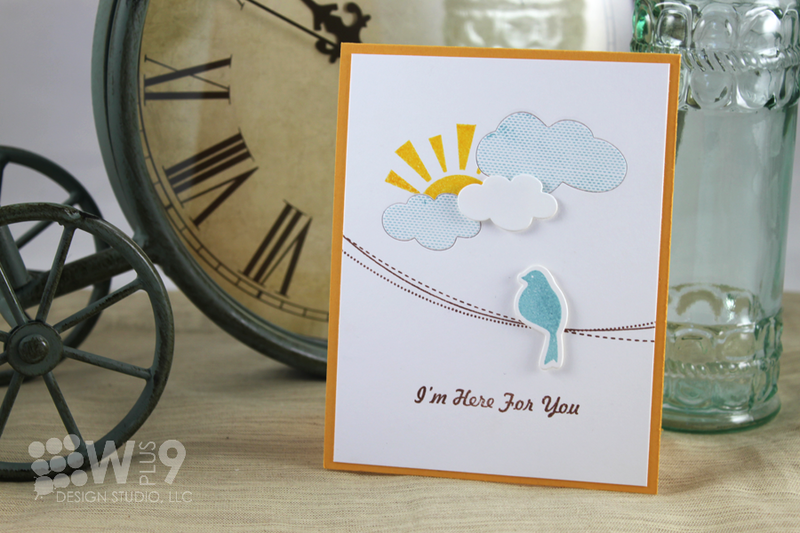 Again, thank you so much for supporting Wplus9 and choosing to shop with us. I am so excited about the upcoming year and look forward to sharing everything we have in store with you. 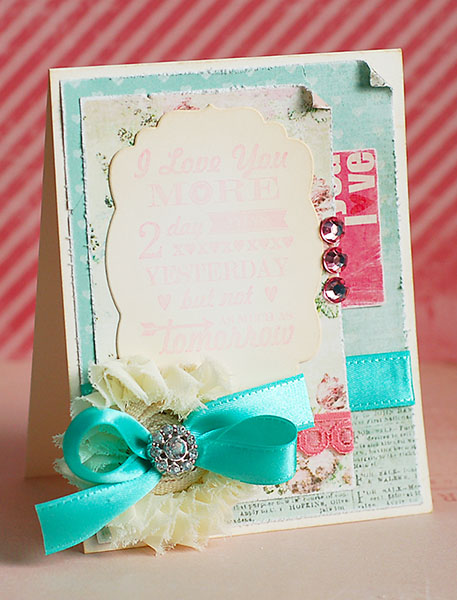 We hope to continue to be able to inspire you and supply your crafting needs for many years to come. If you want to be the first to be notified of any store updates, please subscribe to the RSS feed by clicking the icon on the store website next to the "Recent News" heading on the home page. Thanks again, and I hope that you all have a very Merry Christmas! 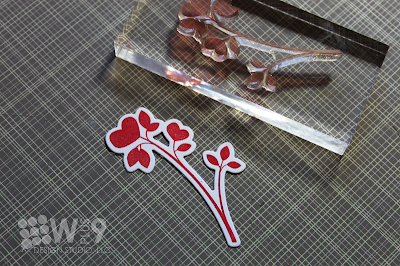 It's not very often that I craft or create without an end goal in mind these days. I must admit, I do miss those days. Today's card is the product of one of those rare opportunities. A little bit of free time. No deadline. No challenge. No plan. No recipient in mind. It had been quite awhile since I used the pattern images from Poinsettia Patterns. 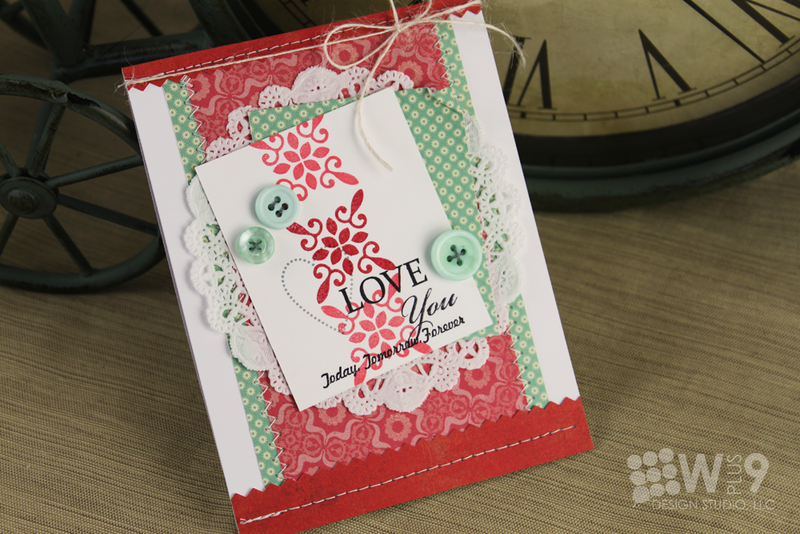 I decided to pair them with Spring Post and Love You More, to create a colorful love card suitable for any time of year. 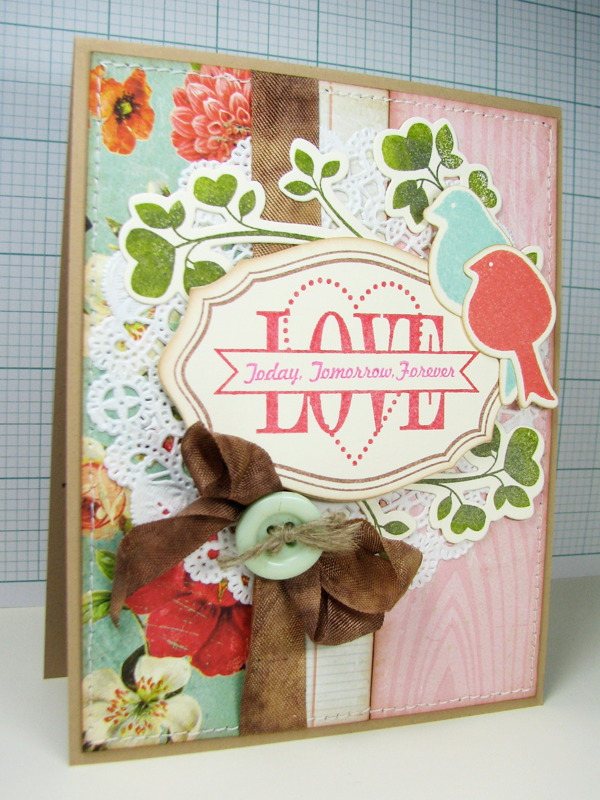 I started with the sentiment panel and then pulled from my stash of papers to match the colors I'd starting stamping in. It's Release Day! All of our Dec/Jan 2012 stamps are now available for purchase at www.wplus9.com. If you missed the release, you can start here to catch up. Aren't they all wonderful?! I can't express how much I appreciate these ladies...and you. I have enjoyed seeing so many new names and reading all of the comments you all have left. Thanks so much for joining us for this release! It's time for the full reveal! Time to show you the sets we are releasing this month in their entirety. All products will be available for purchase on December 5th at www.wplus9.com. We have had record participation this month, and I can't thank you enough for sharing a small portion of your day with me. But, I can do one more giveaway. Want to win the entire release? Just leave a comment by 10:00 PM EST TONIGHT December 4th to enter. I will select one random winner from all comments. Winners will be posted here by 11:00 PM EST. 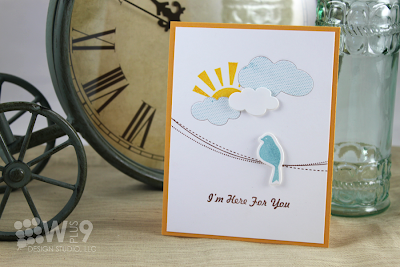 Welcome back to day 3 of our Dec/Jan Release! 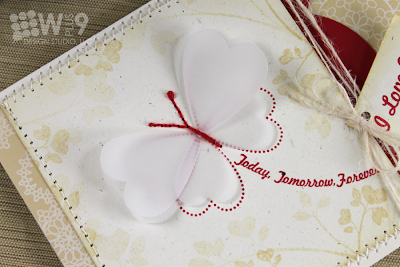 If you are just joining us, be sure to check out the last two days of previews beginning here. Thank you so much for all of the kind comments you all have left so far. I am so happy to hear how excited everyone is for this release! 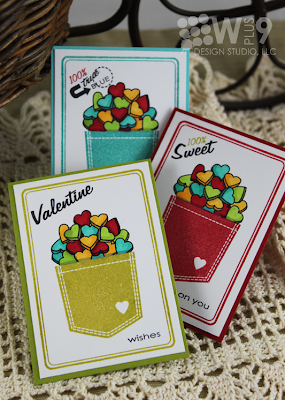 Are you ready for a pocketful of fun?! 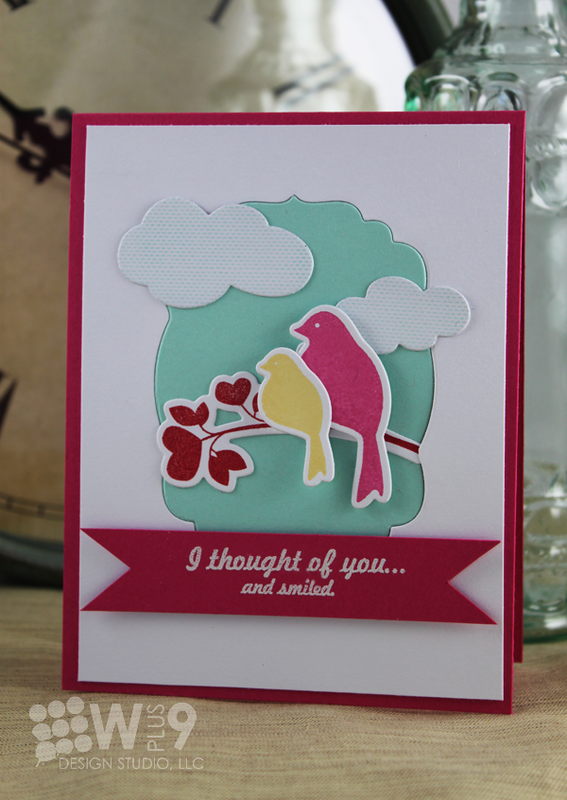 First up, a bright and cheerful card full of personality. 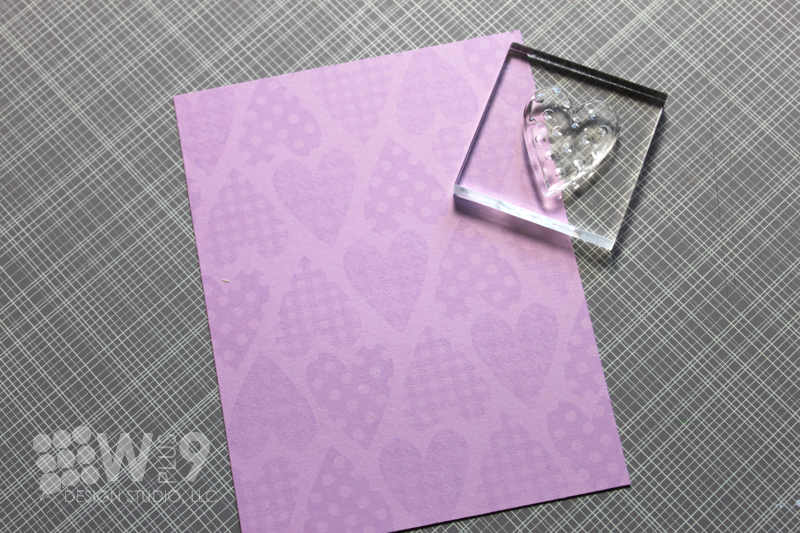 To create the background panel, I stamped the small solid envelope and little solid conversation hearts randomly similar to this. 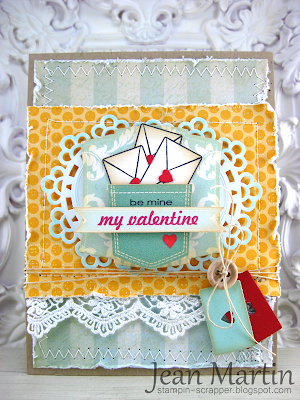 For the focal point, I used the large envelope die cuts by themselves. I added a little postmark using Postmarked, and stamped "Be Mine" from the A Pocketful: Valentine set directly onto the envelope. I matted the letters using Label Layers 2. 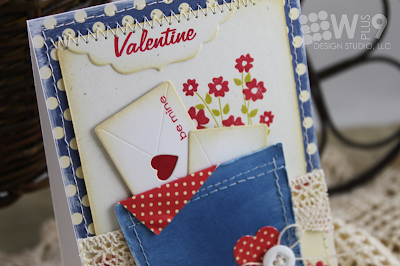 Next up, a card that almost found it's way to the trash. 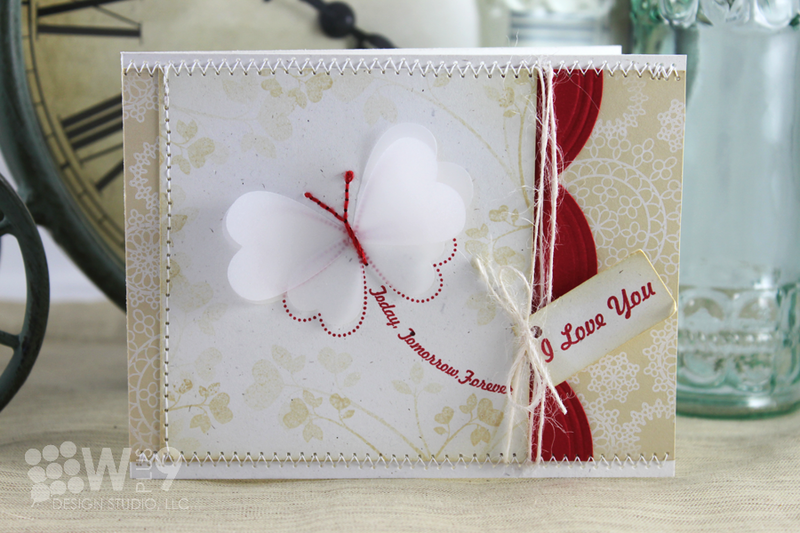 It just wasn't doing it for me until I added the natural white panel and stamped the flowers from A Pocketful. Crazy how that happens, huh? 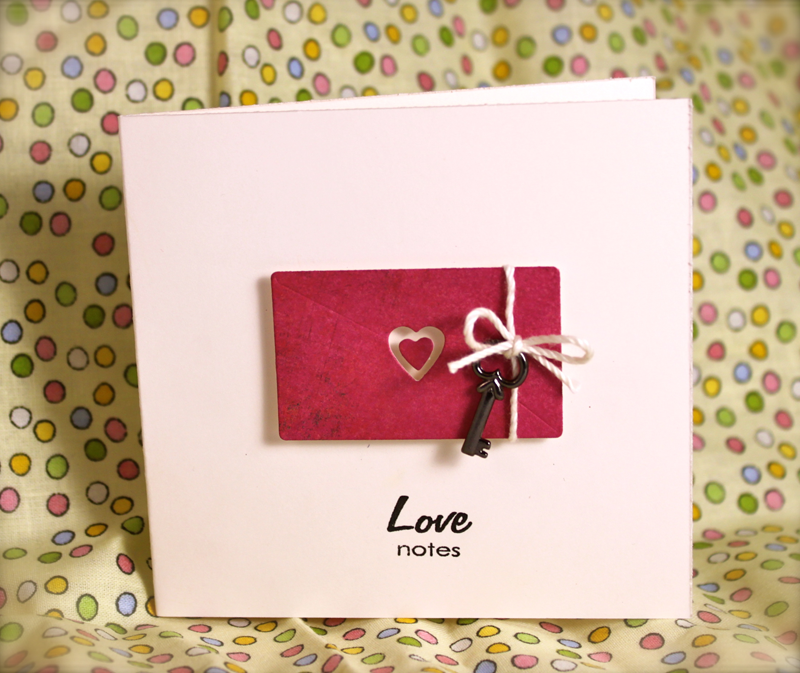 I used the large pocket from the A Pocketful Die to tuck the large envelopes from the Love Notes Die into. I wanted to show you an up close shot of all of the dies from this set. They are so detailed. 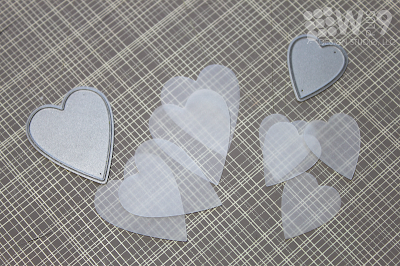 Each die has embossed lines and little hearts that are punched out when you cut them. 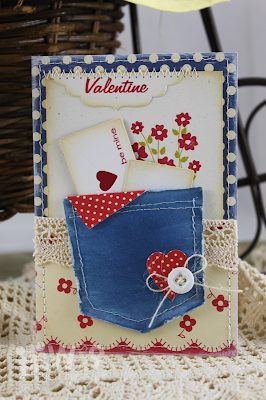 You can see where I've used distress ink on the small pocket to bring out the faux stitching created by the embossing. 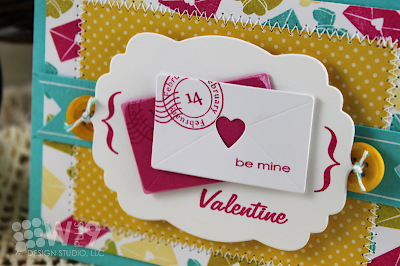 To add my sentiment, I cut a label from Label Layers 2 and used just the end and stamped "Valentine" from A Pocketful: Valentine onto it. 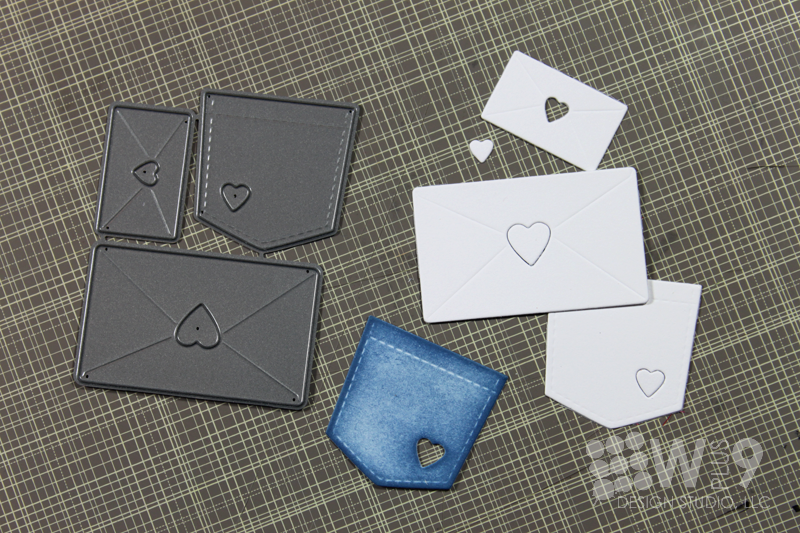 To make the heart in my envelope stand out, I adhered a little scrap of red cardstock to the back. 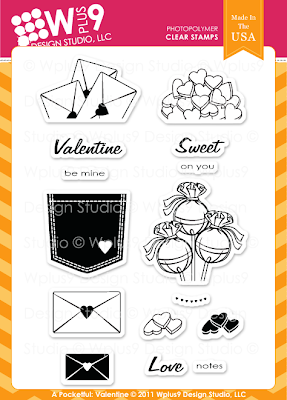 Finally, I wanted to create some little valentines that would be easy to mass produce and hand out at school. With the fun images, and by mixing and matching the sentiments from the original A Pocketful set you can make both boy and girl appropriate valentines. Aren't they adorable? 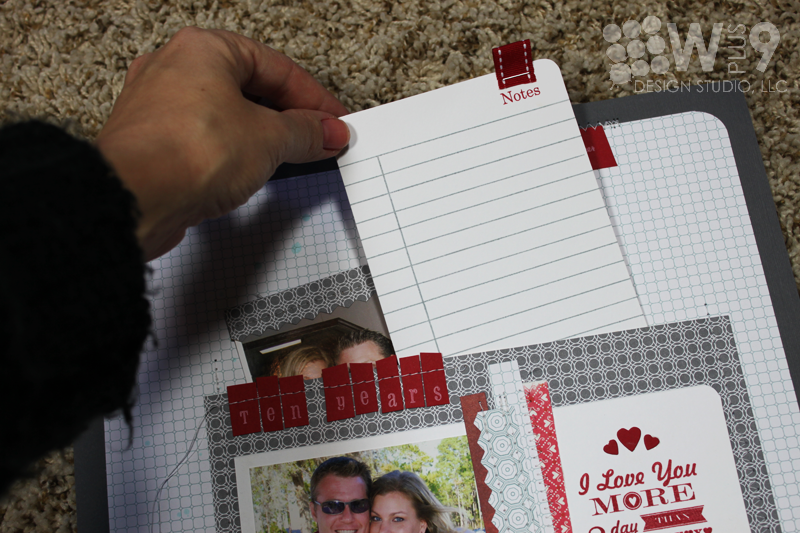 These are so fun and easy to make. The finished size is 2.5 x 3.5 inches. 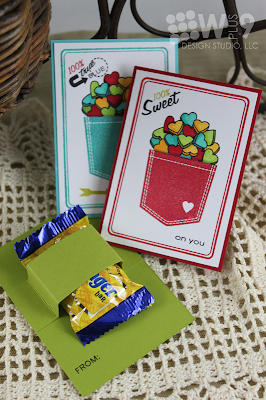 To attach the candy I used a 1 inch x 3.5 inch strip scored as shown below and adhered to the back of the card. 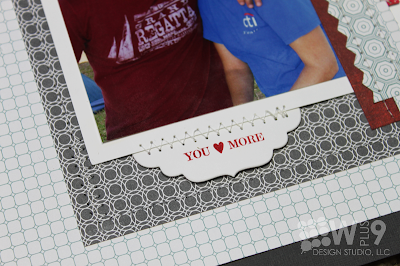 The border image from Class Act created a perfect frame for each one. I used the outlined cluster of conversation hearts to fill each pocket and colored them with Copic markers. 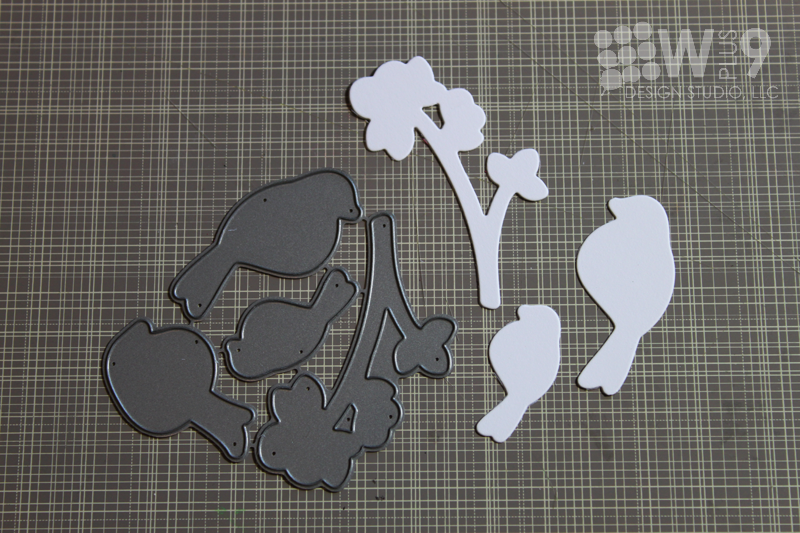 These would make a great project for the kids to help with. You could pre-stamp them and then pass them off to the little ones to color with markers, crayons, or colored pencils. I really hope you have enjoyed all of the sneak peeks so far. And please be sure to visit the design team to see more. 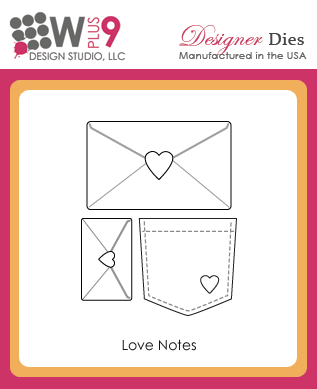 Would you like to win A Pocketful: Valentine and the Love Notes Die? 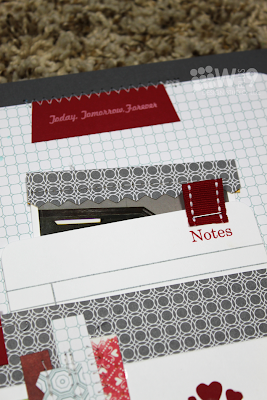 Just leave me a comment by 9:00 AM EST December 4th to enter. I will select one random winner from all comments. Winners will be posted here. 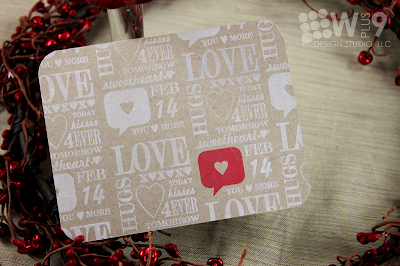 I will be back tomorrow with the full reveal, and another chance to win! 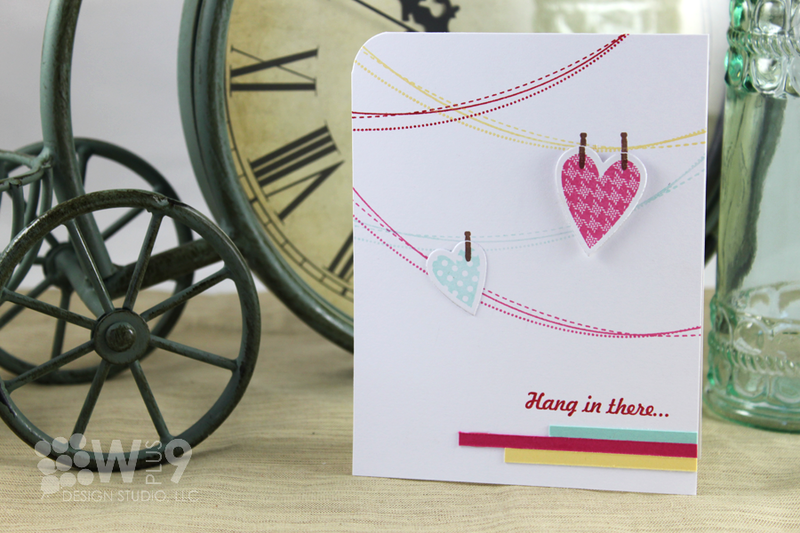 And we have a coordinating die for one of our very first releases. This die, takes Love Birds to a whole new level of fun! 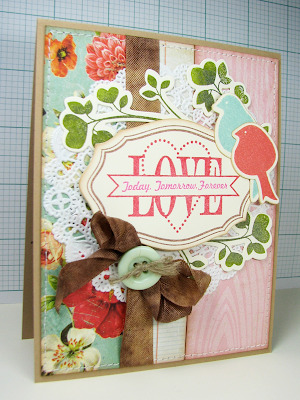 First up, a bright and clean card featuring the new Love Birds Die and stamp set paired with Heartfelt Mix. These sets work so well together. I started by prepping all of my pieces, which meant cutting out my die cuts. 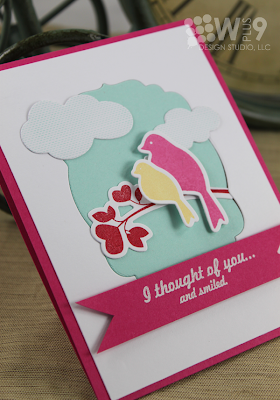 The Love Birds Die comes grouped together on one die, but can easily be separated by snipping the little metal connectors to be used for negative cutting. Then I stamped all of my pieces. 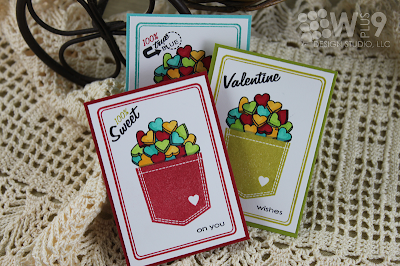 The dies are generously sized and the stamps are trimmed close to the images, making lining up and centering your stamps on these dies a breeze! 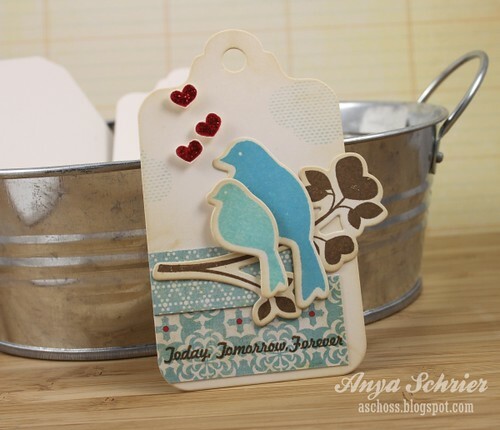 I used the Label Layers 2 Die as a backdrop for my little birds perched in the tree. I cut the label first from blue cardstock, and then again from white. I nested the resulting blue label die into the negative space of the white one for a unique twist on using die cuts. 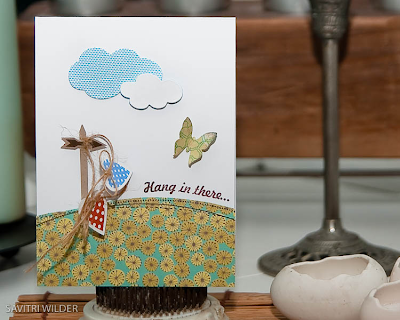 I added some clouds and my sentiment, both from Heartfelt Mix to finish this card off. Next is another "morph" card from the previous, continuing with the same idea of nesting my die cuts. I cut out my clouds first and stamped them with the cloud image from Heartfelt Mix. The clouds from this die and stamp combo are created without a border. 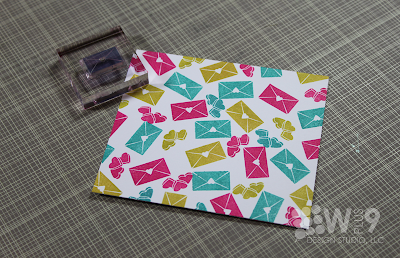 The die cut is slightly smaller than the stamp image. 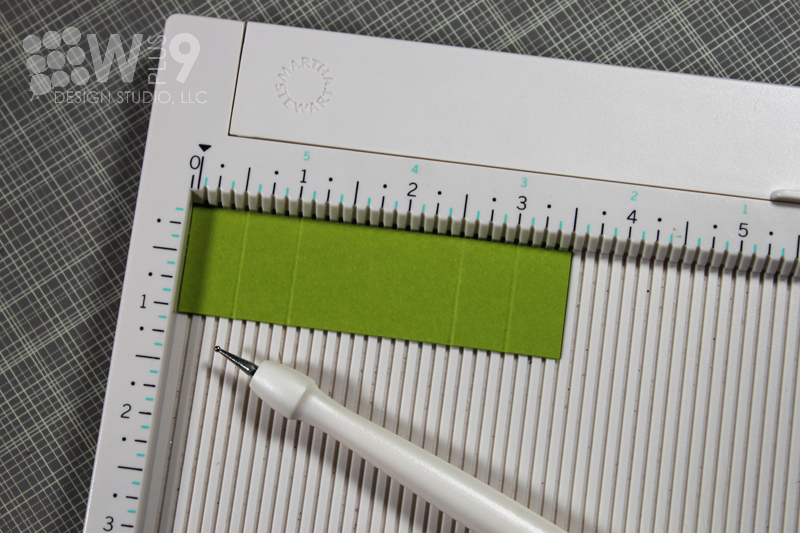 This allows the pattern to bleed from edge to edge. It also creates some great layering opportunities for layering the stamp and die cut separately as I've done in this example. 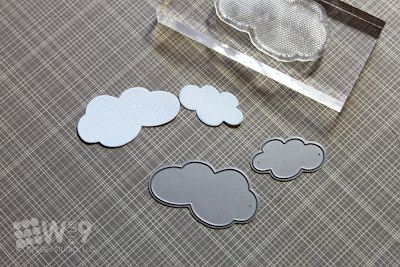 After stamping, I nested the clouds back into their negative spaces and layered another plain white cloud on top. 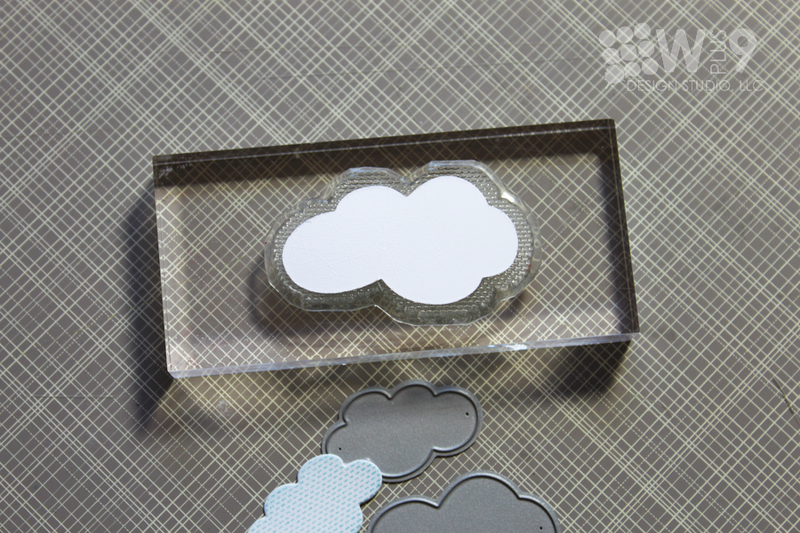 Oh, and did you see the little sun from A Pocketful peeking out from behind the clouds? 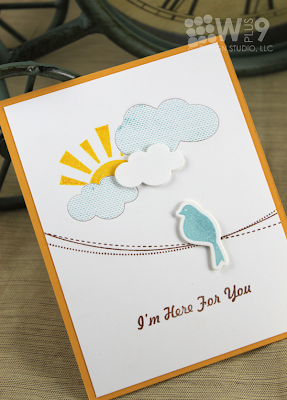 I added my sentiment and a little wire/string image from Heartfelt Mix to perch my bird on to finish this one off. 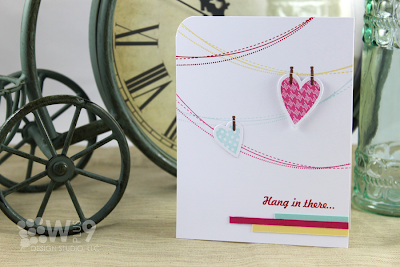 Next, I wanted a fun and cheerful little "pick me up" card. 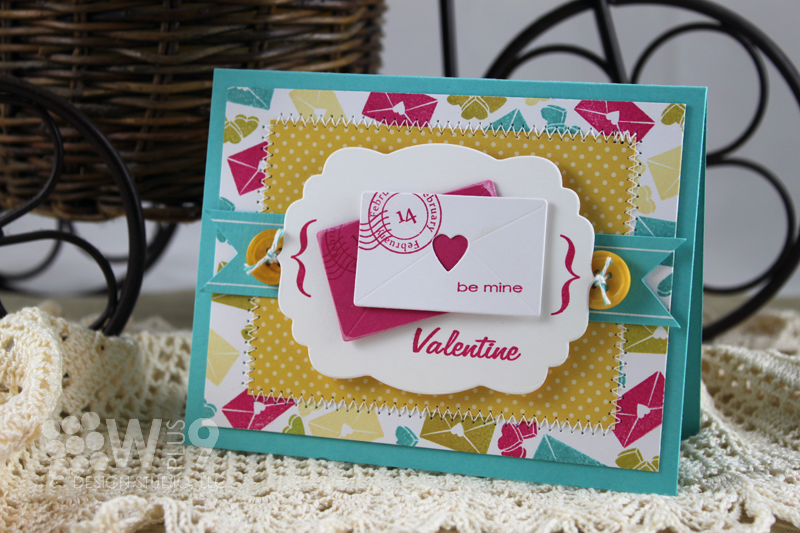 I started by stamping the triple string image several times in pink, red, blue, and yellow across the front of my card base. 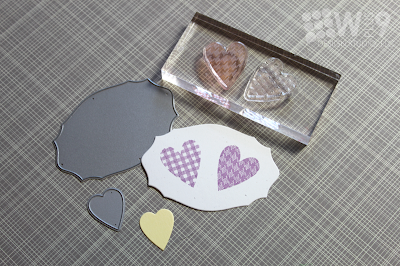 I then used the Hearts & Clouds Die to cut out a small and large heart. I stamped them each. 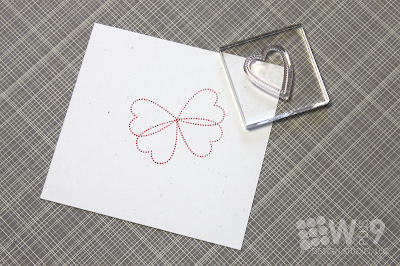 There are 4 patterns included for the large heart and 3 for the small heart. 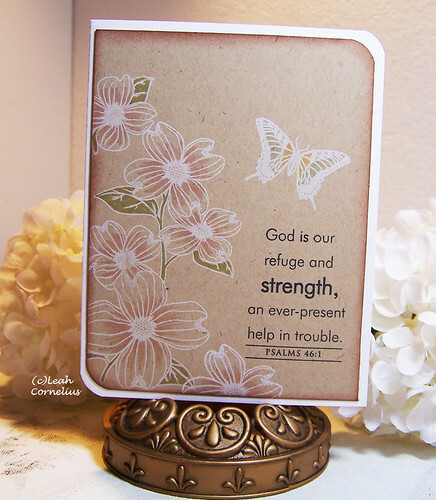 I used the old fashioned clothespin image to "hang" them from the string. Next, I wanted to do a "baby" card. But one for the new parents. I love the idea of using the large hearts to represent the parents, and the small one to represent the new little one. 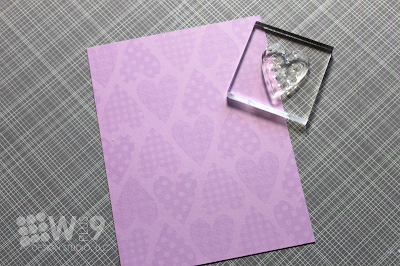 First, I created a background pattern by stamping several of the large heart images in a tone-on-tone fashion. 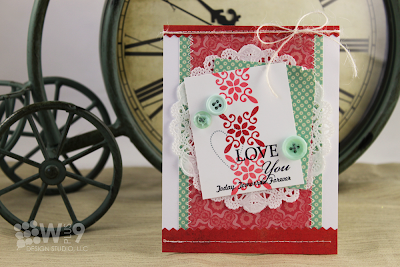 For the focal image, I used our Label Layers 3 Die, two of the heart images stamped directly onto the label, and the small heart die cut from the Hearts & Clouds Die stitched in the center. My sentiment and a little lace border from Mehndi Medallions at the top finish this one off. 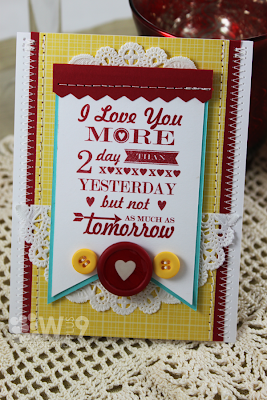 My final card is probably my favorite of the day. 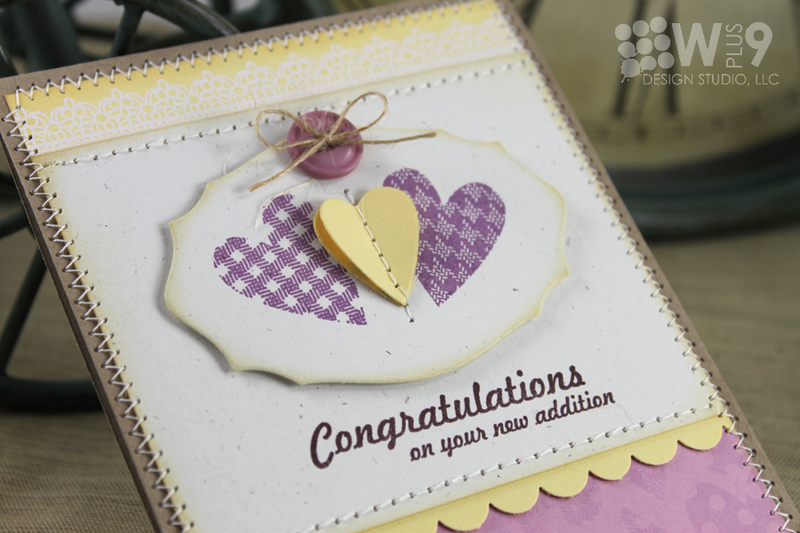 I made a fun little discovery while playing with the dotted heart stamp from Love You More and the heart die cuts from the Hearts & Clouds Die. I then die cut a bunch of the hearts from vellum. I wasn't sure how many I would use at the time, but I ended up using 4 large (2 layers each side for the top wing) and 2 small (1 layer each side for the bottom). 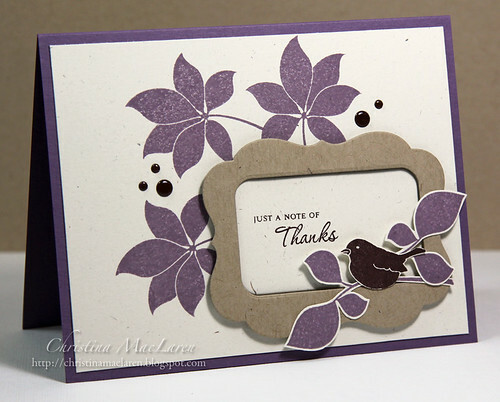 Some foliage from Love Birds and little Mehndi Medallions background stamping finish this one off nicely. I really hope you are enjoying the previews so far. These sets are so much fun to use. Be sure to stop by the Design Team's blogs to see what they have done. They always think of something that I haven't. Would you like to win Heartfelt Mis, Love Birds, the Hearts & Clouds Die, and the Love Birds Die? 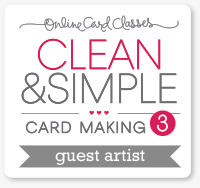 Just leave me a comment by 9:00 AM EST December 3rd to enter. I will select one random winner from all comments. Winners will be posted here. 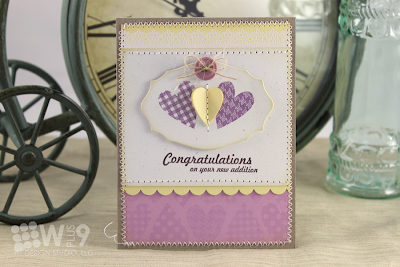 The fun continues tomorrow with another stamp set and coordinating die, see you then! Hello! Can you believe it's December already? And, it's that time again...Release Week! For those of you that are new to Wplus9, we will spend the next couple of days getting up close and personal with the products that we will be releasing this month. All previewed items will be available for purchase on December 5th at www.wplus9.com. 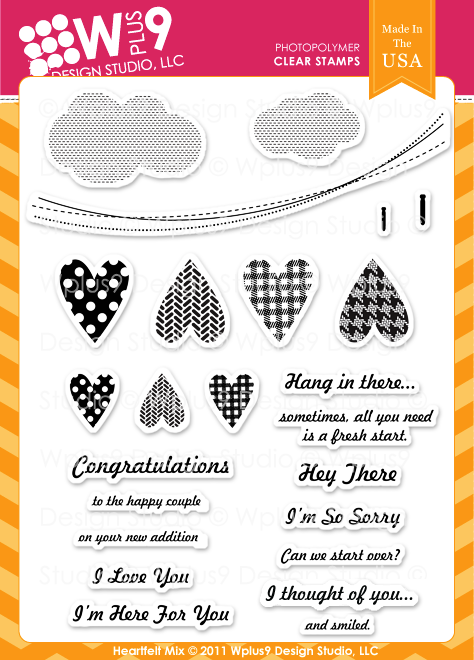 Before we get started, I want to announce that starting with this release, we will now be releasing new stamps every other month. Don't worry, we still have tons of ideas and new stamps coming, just on a little different schedule. So let's get started with our Dec/Jan release shall we. 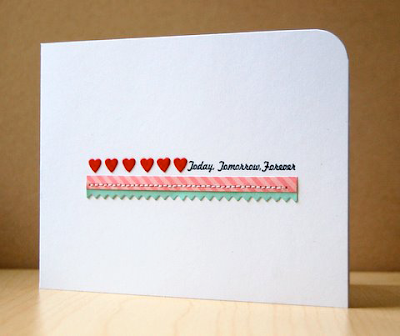 This release is all about Valentine's Day. And today's stamp set is amazing. Let's face it, most of the time we are creating for our men when it comes to this holiday, or for our children's classmates. 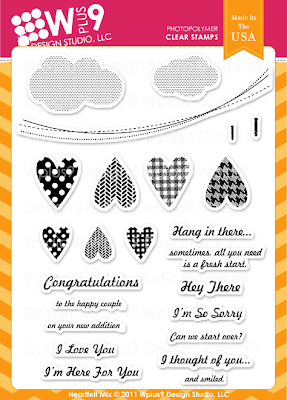 This set is gender neutral, packed with mix and match graphics and sentiments, bold, classic, and 6"x8" of fun! First up, I knew I wanted to use the word art image that started the set. 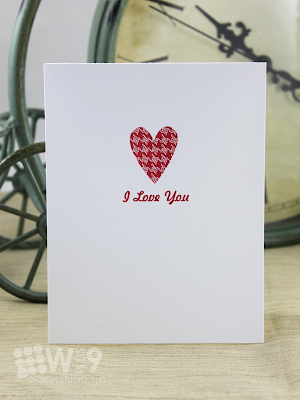 It's a little something I used to write inside cards to my husband. 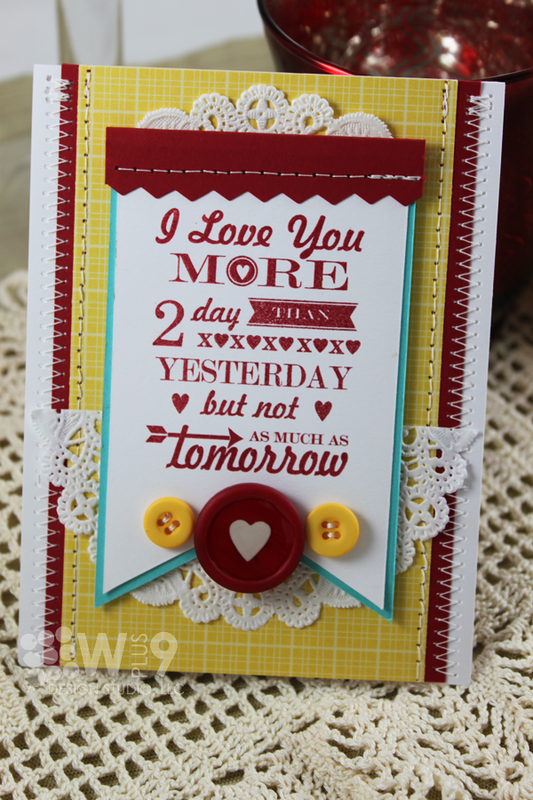 "I love you more today than yesterday...but not as much as tomorrow." He can always count on getting at least one card a year with this hand written inside. 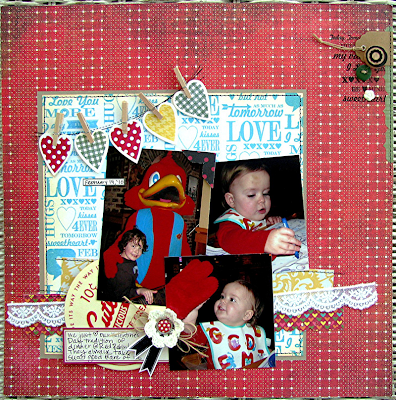 Our ten year anniversary is also this Valentine's Day, so I decided to create a scrapbook page to mark this milestone. Whew! Ten years. Shouldn't we get a trophy or something?! 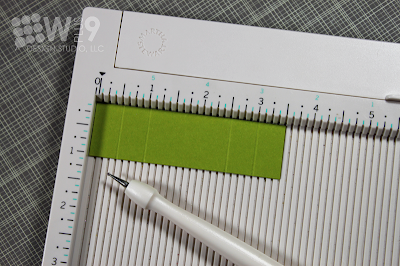 I stitched the gray patterned paper to the bottom half of the page to create a pocket. Inside I tucked a journaling card I created using the primary journal background lines from Classroom Backgrounds, and another of my favorite pictures of us. I will continue to add things here and there before our anniversary. On the right side I stamped the large word art image in red. I love this image. Talk about quick and easy! I added some little die cut envelopes to the bottom corner (more on these later this week). I added some little sentiments here and there, "Today, Tomorrow, Forever" to the top. 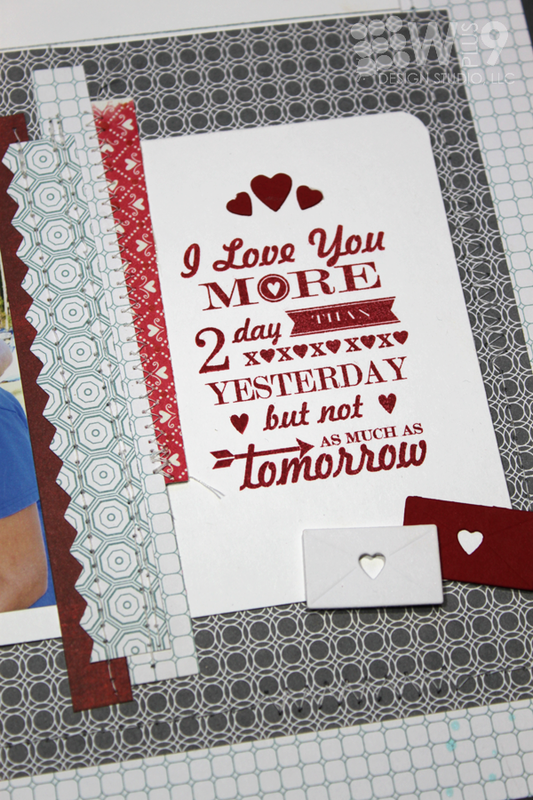 And "Heart You More" to the bottom. Too easy? 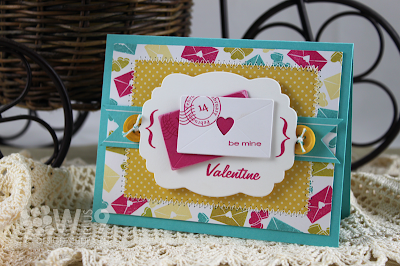 How about 2 stamps and some clever scoring? 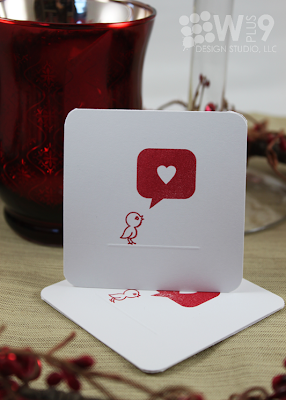 Pair the heart bubble image with the bird from The Birds & The Bees for a cute little set of mini note cards. Still too clean and simple? OK, use the word art as a starting point for a card that looks incredibly detailed and involved, but still only uses one stamp. I have only scratched the surface of this set. Be sure to stop by the Design Team's blogs to see what they have done. 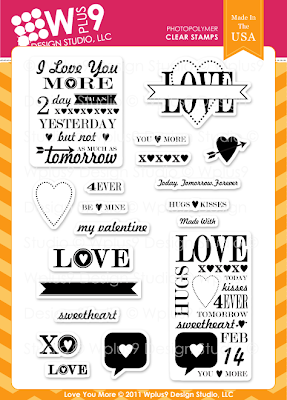 Would you like to win Love You More, and The Birds and The Bees? Just leave me a comment by 9:00 AM EST December 2nd to enter. I will select one random winner from all comments. Winners will be posted here. The fun continues tomorrow with another heartfelt set and coordinating die, see you then!